“And Rachel Stole the Idols is an important contribution to the growing and diverse field of Jewish women's studies. Pointing to an early instance in Hebrew literary history, And Rachel Stole the Idols takes its title from a biblical episode in which a daughter seizes control of a paternal spiritual legacy and makes it her own. This episode is the thematic key to Wendy Zierler’s in-depth research of the ways modern Hebrew women writers—after centuries of silence—took control of the language of Hebrew literary culture, laying claim to icons of femininity and recasting them for their own purposes. Zierler picks up where other Hebrew scholars have left off, offering original analysis that brings feminist theory to bear on the study of modern Hebrew women writers. In recognition that there is no single feminist approach, nor a universally accepted definition of gender, this book incorporates a broad range of feminist reading strategies—including Anglo-American gynocriticism, French feminist theory, and feminist critical methods in anthropology, biblical studies, and geography. The chapters within examine the translated work of women who made early and significant contributions to nineteenth-and early-twentieth-century Hebrew literature. These range from prose writers Sarah Feige Meinkin Foner, Hava Shapiro, Nechama Pukhachevsky, and Devorah Baron, to poets Rachel Morpurgo, Rachel Bluwstein, Yokheved Bat-Miriam, Esther Raab, Anda Pinkerfeld-Amir, Shulamit Kalugai, and Leah Goldberg. 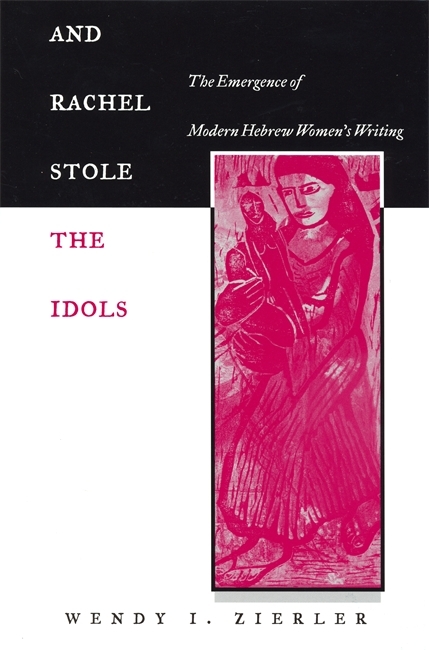 Along with its provocative scholarship and large number of original translations, And Rachel Stole the Idols makes a vital contribution to Jewish women’s studies, in general, and Hebrew literary studies, in particular, as the first book-length English-language study of its kind. Wendy Zierler is assistant professor of modern Jewish literature and feminist studies at Hebrew Union College—Jewish Institute of Religion, New York. And Rachel Stole the Idols has commendable grounding in biblical and rabbinic sources; by bridging these classic sources, modern uses of them, and contemporary feminist theory, Zierler brings to English readers a sense of the profoundly polyphonic, intertextual richness of Hebrew poetry." Zierler shows how a number of talented female poets and writers took control of the language of Hebrew literary culture and impressed on it their own feminine (and sometimes feminist) styles, values, and images. With many original translations and a stimulating combination of Jewish literary and feminist scholarship, And Rachel Stole the Idols is an important contribution to the growing and diverse field of Jewish women's studies. Zierler's work has made a worthy contribution to the field of women's literature and to rewriting the history of Modern Hebrew literature."